In a series of miraculous events that could only have happened through the perfect plans of God, a Colorado missionary and several other collaborators gave one special little boy an incredible, life-saving blessing! "Little John" Olivier, just 9 years old, has spent the past several years of his young life with a tumor growing so aggressively on his jaw that it was adversely affecting his speech, the alignment of his teeth, even his ability to eat! But when Calvary Chapel of Brighton, Colorado sent a group of missionaries to Little John's home country of Haiti, it became the mission of Barclay Stuart to see that this sweet boy got the treatment he needed. Beyond just making speech, chewing, and swallowing incredibly difficult, it was revealed that Little John's tumor would continue to grow until it suffocated and killed him, which doctors suspected would give him just one more year to live. 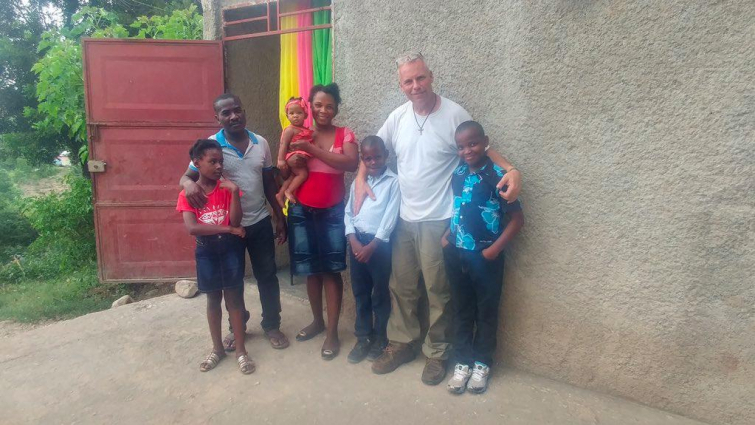 Whilte still in Haiti, Stuart felt incredibly moved to do something for Little John, but not knowing just yet what God would do, he took a photo with the young boy and promised to do whatever he could to get him the help he desperately needed. On his journey home, however, a small, annoying encounter led to God showing up in a huge way! While waiting on his flight to return to Colorado, Stuart says he set his bag down to reserve a table at the airport, hoping to catch a bite to eat before his long trip. As he waited in line at one of the airport's restaurants, Stuart watched as a group of strangers moved his bag to take the table. "I wasn’t real happy about that,” Stuart admitted, but he kept his witness in mind and struck up a conversation with them when he went to politely confront them. He would soon find out that the man who moved his bag was the answer to his prayers for Little John. Not only was the man a medical missionary, he was a facial surgeon! An anesthesiologist and a hospital board member were also a part of the group and, after seeing Little John's photo and hearing his story, they all agreed to perform his lifesaving surgery totally free of charge. This massive hurdle between Little John and his treatment was removed, but Stuart's work wasn't over yet. He spent the next several months praying and fundraising with his church in order to totally cover all the other expenses that follow when you pack up a family from Haiti and bring them to America for intensive surgery. God's work wasn't done yet, either. Stuart and his church collected more than $10,000 in donations, a Denver-area company donated expensive surgical devices needed for the procedure, and the surgeon from the airport and his staff at Avon Oral, Facial and Dental Implant Surgery held up their promise to perform the surgery for free. Little John flew with his father, Jean Luckner Olivier, to Connecticut for the surgery not long after. Stuart said they stayed with a gracious Muslim family there, who "welcomed everyone involved with open arms and fed them all," CBS reports. After having his surgery, Little John then flew with his father to Colorado to complete his recovery and meet the incredible people who served as the hands and feet of God to work this miracle in his life.